A flamboyant Renaissance Italian discovers how heavy our air really is: The air filling Carnegie Hall, for example, weighs seventy thousand pounds. A one-eyed barnstorming pilot finds giant rivers of air that blow five miles above our heads with the force of a hurricane. An impoverished American farmer figures out why storms move in a circle by carving equations with his pitchfork on a barn door. A well-meaning but ill-fated inventor creates wonder chemicals that nearly destroy the ozone layer (he also came up with the idea to put lead in gasoline). A reclusive mathematical genius with a predilection for painting his toenails cherry red figures out the technology that allowed the rescue of passengers on the Titanic. 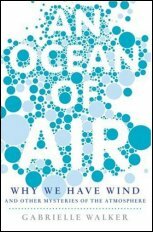 An Ocean of Air is a triumphant celebration of the Earth's atmosphere and a completely engaging work of popular science.